With golf's most prestigious weekend on the horizon, ezVote brings you some interesting trivia about the Masters and its founding father. I love golf. I've played for years, and I'm an active member of my local golf and country club. As a matter of fact, my passion for golf is the reason that ezVote exists today (my club provided the test case for ezVote's very first online election in 2012). If you're a golf fan, you know that the sport's premiere event is next weekend. The Masters Tournament begins Thursday from beautiful Augusta National Golf Club. For myself and millions of other fans, the Masters is must-see TV. So, in honor of the Masters and ezVote's humble beginning as a platform for country club elections, my staff and I have compiled some interesting facts about the tournament, Augusta National, and its founding father, the great Bobby Jones. Enjoy! Bobby Jones is widely considered the most successful amateur golfer of all time. Though he was one of the game's greatest stars, Bobby Jones played his entire golf career as an amateur. Jones took the nickname “Bobby” to distinguish himself from renowned course architect Robert Trent Jones. An exceptional scholar, Jones held bachelor degrees in mechanical engineering and English literature, and passed the Georgia bar exam after just three semesters of law school. In 1930, Jones became the first competitor to win golf's single-year Grand Slam (British Amateur, British Open, U.S. Open, U.S. Amateur). Bobby Jones is one of only two Americans named as a Freeman of the City of Saint Andrews, Scotland. The other American Freeman is Benjamin Franklin. Early in his amateur career, Jones was known for his short temper on the course and his proclivity to throw his clubs in anger. Though he co-designed the Augusta National course and co-founded the Masters, Jones failed to finish the Tournament under par in all twelve of his attempts. 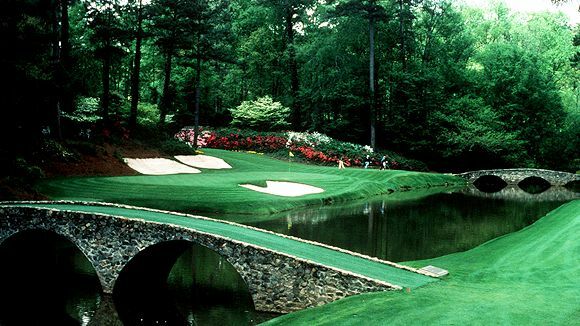 Augusta National's picturesque “Amen Corner” is one of the most recognizable locations in all of golf. Augusta National was built on the site of Fruitland Nurseries. Each hole on the course is named after a species of tree. Historically and all-male club, Augusta National welcomed its first female members—Darla Moore and Condoleeza Rice—in 2012. President Dwight D. Eisenhower unsuccessfully lobbied Augusta National in 1956 to remove the infamous pine tree on the 17th fairway that eventually bore his name. The famed “Eisenhower Tree” was finally removed in 2014 after sustaining severe damage from an ice storm. Jordan Spieth celebrates his victory at the 2015 Masters. Spieth became the second youngest champion in tournament history, and tied Tiger Woods' 1997 record score of -18. Hall-of-famer Fred Couples is one of 16 players who claim the Masters as their only major championship victory. Jordan Spieth led the 2015 tournament wire-to-wire, tying Tiger Woods' Masters scoring record of -18. Spieth missed a 5-foot putt for par on the 18th hole, which would have broken the record. In 1997, at age 21, Tiger Woods became the youngest player to win the Masters. Jack Nicklaus became the oldest player to win the tournament in 1986 at age 46. Only 13 non-American golfers have won the Masters since its founding in 1934. Gary Player (first non-American winner) and Sir Nick Faldo have each won three Masters championships. The last foreign born champion was Australian Adam Scott in 2013. Per Augusta National rules, the tournament winner must return the coveted Masters green jacket to Augusta National at the conclusion of his championship year, and afterward may only wear it while on the club grounds. Only two Masters green jackets exist outside of Augusta with the club's permission: Gary Player's first jacket (on display at his personal museum in South Africa), and Henry Picard's (on display at Canterbury Golf Club in Beachwood, OH). Other jackets in the possession of pros or collectors are considered to be held in violation of the club's rules.